I will start by acknowledging this: I am lucky to be working with monarch butterflies. Not only are they fascinating and beautiful, very few labs in the country have colonies to run year-round bioassays. At Iowa State University, where I am a PhD student, the colonies are maintained by the U.S. Department of Agriculture (USDA). The photos below were taken from USDA’s monarch butterfly colony in Ames, Iowa. There are several factors that make monarchs captivating species: their four-stage life cycle, their annual passage across North America, their reproductive diapause (i.e., suspension of mating) before migration to overwintering sites, and so on. As you can find all this information easily online, I will stick to something which isn’t written or published anywhere (yet! ): my research. I assess the risks of insecticide exposure on monarch butterfly larvae. Before I delve more into this exciting work, I would like to explain why it is important and what can be achieved with this research. In the US you see two major migratory populations, one to the east of the Rocky Mountains and the other to the west. Both populations have declined by nearly 80% in the last two decades¹. In response to this, U.S. Fish and Wildlife Service (USFWS) was petitioned to list the monarchs as endangered species. The agency will come up with a listing decision in June 2019², but in the meantime released a working document that stressed the need to know risks of insecticide exposure on the butterfly³. The decline also made then President Obama specifically include monarch butterflies in his Pollinator Memorandum, where he tasked the U.S. Environmental Protection Agency (USEPA) and USDA to restore their populations⁴. One of the major reasons for the butterfly decline is believed to be the loss of milkweed⁵- the only food the caterpillars eat. Thus, conservation efforts are focused on planting milkweeds, especially in Iowa and the neighboring Midwestern states, which form the summer breeding grounds of the eastern monarch migratory population. As these states also have large swaths of land devoted to agriculture where insecticides are often used, there is a concern that planting milkweeds in such landscapes could negatively impact larval survival and adult recruitment. Because of this concern, USDA issued a guideline discouraging milkweed establishment within 125 feet of insecticide-treated crop fields⁶. For a representative county in Iowa, we found that this ‘no plant zone’ would exclude over 80% of rural roadside rights-of-ways and nearly 40% of non-crop lands. That is a lot of area being lost where potential habitat could go. And unfortunately, there is very little monarch toxicology or exposure data to know at what distances to plant milkweeds away from insecticide-treated fields. And that’s what my lab is trying to find out! We selected insecticides commonly used in corn and soybean fields, as they are the predominant crops grown in the midwestern states. Our six representative insecticides cover four different groups based on modes of action: pyrethroid, organophosphate, neonicotinoid and anthranilic diamide. In corn and soybean fields, these insecticides are either sprayed or coated on the seeds. If they are sprayed, they can drift and land on nearby milkweeds or larvae. If they are coated on seeds, they can leach into the soil and be absorbed by milkweeds downslope of the crop field. Thus larvae can be either directly exposed to insecticides through their cuticle or indirectly exposed by consumption of milkweed leaves. Our toxicology bioassays mimic these two routes of exposure. Determining the toxicity of insecticides on the larvae by generating dose-response curves, i.e., finding concentrations that cause a spectrum of mortality (0% to 100%). Estimating exposure concentrations that the larvae are likely to face at different distances from treated fields (the further away they are, insecticide exposure will decrease). We rely on computer models and field studies to obtain this information. Using the dose-response curves and exposure estimates to calculate larval percentage mortality at different distances away from the field. This is called a patch-scale risk assessment. Incorporating the above information into an agent-based model⁷ to see how the monarch population responds at the landscape level. This is called a landscape-scale risk assessment and it is more realistic and informative than a patch-scale risk assessment since monarch butterflies fly across the landscape and lay one or two eggs on milkweed stems here and there. They don’t lay all their eggs in one basket! The final step can help answer questions like how many monarchs would be produced with and without a ‘no plant zone’ (125 feet or otherwise) over a ten-year period in Iowa. Based on our data, the habitat placement option that produces the most monarchs can hopefully be implemented on the ground. So far, we have obtained comprehensive results for spray applications where the insecticide directly lands on larvae. Based on our toxicology studies, pyrethroid (beta-cyfluthrin) and anthranilic diamide (chlorantraniliprole) insecticides cause the greatest mortality, followed by organophosphates (chlorpyrifos). Neonicotinoids (imidacloprid and thiamethoxam) cause negligible mortality, especially to older larvae. The larval mortality away from the field is much greater if the insecticide is applied via an aircraft as compared to ground applications⁸. Based on our landscape modeling data so far, more adult monarchs are produced by planting milkweeds in all available space as compared to scenarios with 125 feet ‘no plant zone’ around corn and soybean fields, even with the larval mortality due to spray drift⁹. 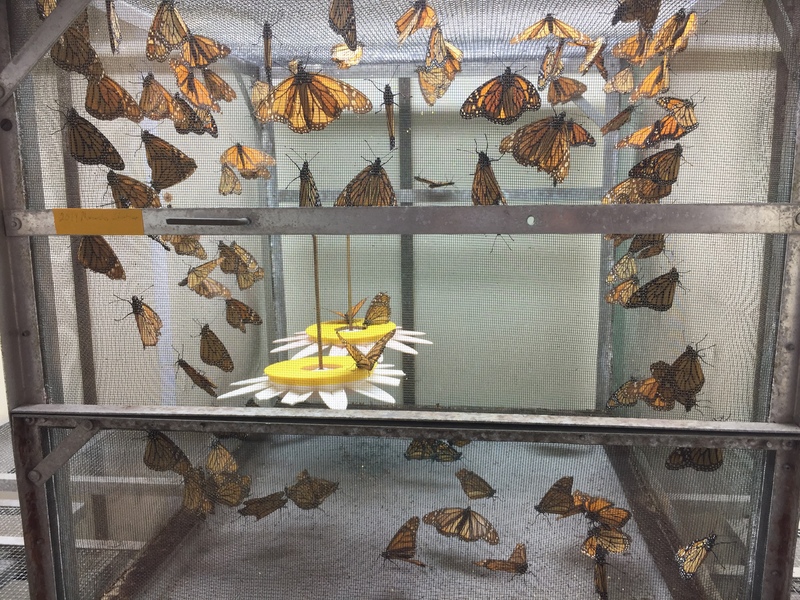 Our ongoing studies are looking at how larval consumption of milkweeds that contain insecticides can influence monarch production and inform options for placement of new habitat. Brower L.P., Taylor O.R., Williams E.H., et al (2012) Decline of monarch butterflies overwintering in Mexico: Is the migratory phenomenn at risk? Insect Conserv Divers 5:95–100. Grant T., Parry, H., R., Zalucki, M.J., and Bradbury, S.P. (2017) Predicting monarch butterfly movement and egg laying with a spatially-explicit agent-based model: The role of monarch perceptual range and spatial memory. Ecological Modelling (Submitted). Krishnan, N., Bidne, K., Hellmich, R., Coats, J. and Bradbury, S.P. (2017) Risk assessment of insecticides commonly used in corn and soybean production on monarch butterfly (Danaus plexippus) larvae. Society of Environmental Toxicology and Chemistry North America 38th Annual Meeting. November 12 -16, Minneapolis, MN (Abstract ID# TP106). Bradbury S.P., Grant, T.J., Krishnan, N. (2017) Landscape Scale Estimates of Monarch Butterfly (Danaus plexippus) Population Responses to Insecticide Exposure in an Iowa Agroecosystem. Society of Environmental Toxicology and Chemistry North America 38th Annual Meeting. November 12 -16, Minneapolis, MN (Abstract ID# 182).